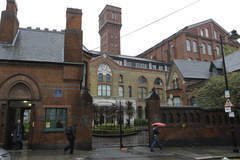 LONDON — Some London residents are getting troops and surface-to-air missiles on their rooftops for the Summer Olympics. Around 700 people living at Whelan’s building in Bow – about 2 miles from London’s Olympic Stadium – have been contacted and warned that the weapons and about 10 troops are likely to be based at the site for around two months. London is hosting the Summer Olympics from July 27-Aug.12. 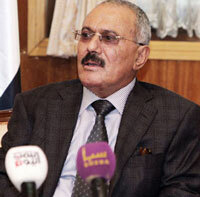 Yemen's former president Ali Abdullah Saleh, January 22, 2012. SANAA — The U.N. envoy to Yemen met Monday with the country’s former president to press him to stop meddling in the country’s affairs, diplomats said, a sign of continuing political instability that has emboldened al Qaeda. The meeting between U.N. envoy Jamal Benomar and the former leader, Ali Abdullah Saleh, came after his son appointed a relative to head a new security unit, defying orders from the current president. In February, Mr. Saleh handed power to his deputy, Abed Rabbo Mansour Hadi, in an internationally backed agreement. Since then, Mr. Saleh has been accused of obstructing Mr. Hadi’s attempts to purge Mr. Saleh’s loyalists from security agencies. The internal conflict, marked by huge demonstrations against Mr. Saleh and violent government repression, has been going on for more than a year. During the political turmoil, al Qaeda-linked militants have taken over parts of the south. 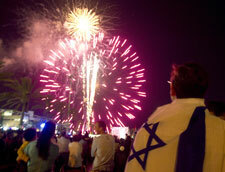 JERUSALEM—Israelis celebrated their country’s 64th anniversary Wednesday with fireworks and military processions at a national ceremony in Jerusalem. The festivities came immediately after Memorial Day for fallen soldiers and victims of militant attacks, an annual ritual of twinning grief with elation and pointing out the link between the two. Preparations for Independence Day were marred last week when a lighting rig collapsed during a rehearsal, crushing a young soldier to death. Government statistics showed that Israel’s population grew by 137,500 since last year to 7,881,000. The Central Bureau of Statistics said 75 percent of the population is Jewish and 21 percent is Arab. The remaining 4 percent represents tiny minorities or immigrants who are not Jewish. b) Why will the troops and missiles be stationed on buildings around London? Why do you think he is now interfering with President Hadi’s rule? b) What percent of Israel’s population is Arab? c) What percent of Arab states’ populations are Jewish? (such as Saudi Arabia, Egypt, Yemen, U.A.E., Lebanon…) Choose one to find the breakdown. d) Why do you think there is such a huge difference between the number of Arabs who are able to live in Israel vs. the number of Jewish people who are permitted to live in Arab Muslim countries? President Ali Abdullah Saleh became the first elected President in reunified Yemen in 1999 (though he had been President of unified Yemen since 1990 and President of North Yemen since 1978). Beginning in February and March 2011, an uprising against the government occurred, and clashes with police and pro-government supporters steadily intensified. Many protestors demanded the immediate resignation of the current leadership, and in particular that of President Saleh. Yemen is one of the poorest and least developed countries in the Arab World, with an unemployment rate of 35%, dwindling natural resources, a young population and increasing population growth. Yemen’s economy is weak compared to most countries in the Middle-East, mainly because Yemen has very small oil reserves. Yemen’s economy depends heavily on the oil it produces, and its government receives the vast majority of its revenue from oil taxes. But Yemen’s oil reserves are expected to be depleted by 2017, possibly bringing on economic collapse. Yemen does have large proven reserves of natural gas. Yemen’s first liquified natural gas (LNG) plant began production in October 2009. Rampant corruption is a prime obstacle to development in the country, limiting local reinvestments and driving away regional and international capital. Foreign investments remain largely concentrated around the nation’s hydrocarbon industry.